I have been MIA over the past week. School, baby and homework have caught up with me. 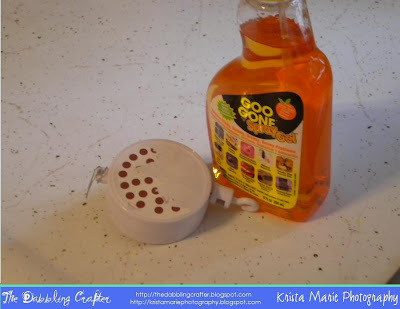 So please excuse my tardiness with this DIY Wednesday post. I made this mobile a few weeks ago and had to share pictures and a tutorial. Click here for a printable PDF version of the tutorial. I knew the basic shape I wanted my owls to be (and I had already used that shape on my owl art, so I knew it would work) so I just got a pad of paper and drew out the owl. 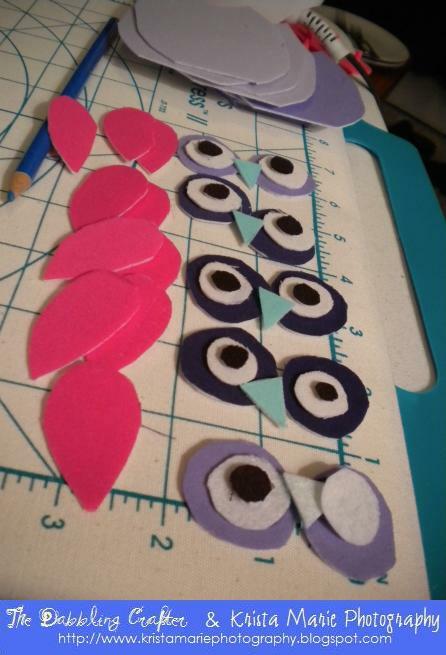 Once I had a drawing of an owl, I cut out each piece to use as a pattern. 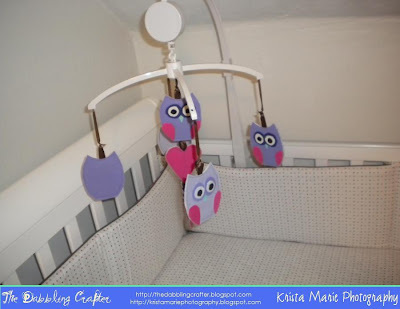 To save you some trouble, if you decide to make an owl mobile, I have included the pattern I used at the end of this PDF. I just uploaded a picture of my finished owls and used that to make the pattern, so please excuse rough edges! It’s the first pattern I’ve ever made. You could also make patterns of other things by just resizing a picture on your computer to be the desired size and printing. Once you have your pattern, cut it out. You could use actual pattern paper if you’re making your own pattern. However, I used plain ol’ card stock and it worked just fine. The card stock made it easier to trace the pattern. In order to make the fabric sturdier, you will want to iron it on to fusible interfacing. To those who don’t sew, this might seem scary. However, it’s quite easy. Go to your local fabric department and look for the iron on interfacing. Then you’ll want to figure out how much of that lovely fabric you bought you will want to use. You could be all scientific about it and measure out how big the owls are and such. Or you could be like me and figure that you can always have extra or iron more fabric on to the interfacing after the fact. Follow the directions on the interfacing package for attaching your fabric to the interfacing. Once you’re done with this step, you should have big blocks of color securely fused with interfacing. Before entering your trace and cut step, you’ll need to map out exactly what color combination you would like to go with. I have included my color combination to give you an idea of how many pieces I had to cut out of each color. 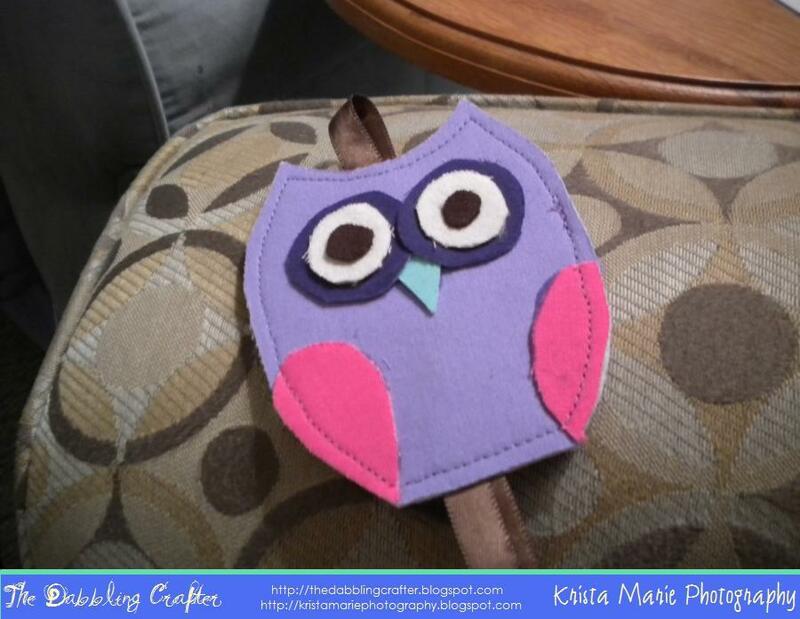 Skip it if you aren’t using the owl pattern or have figured out your own color combination. I had a mobile that had four arms and a center area. I decided to go with medium purple owls on two of the bars and light purple owls on the other two bars. 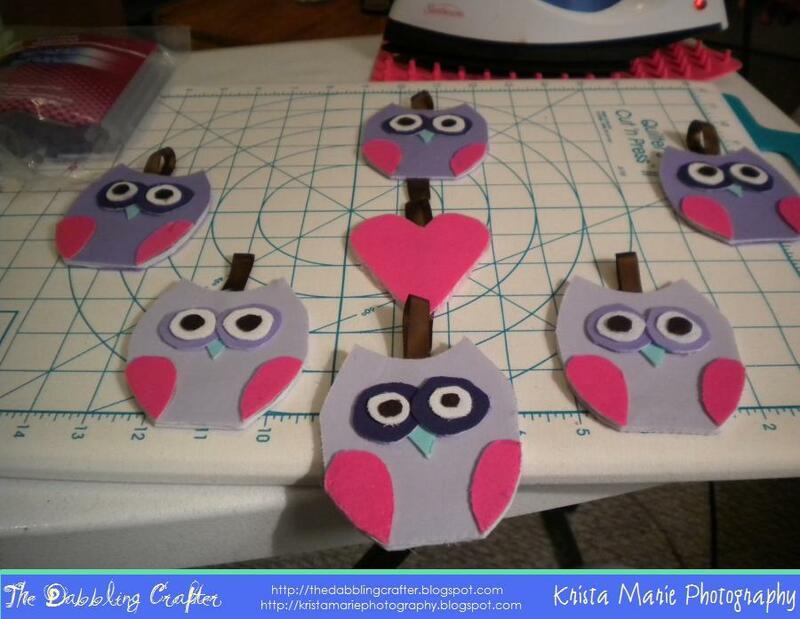 In the center, I went medium purple owl, then pink heart and then light purple owl. I decided to use dark purple on the outside eyes of the medium owls and medium purple on the outside of the eyes of the light purple owls. 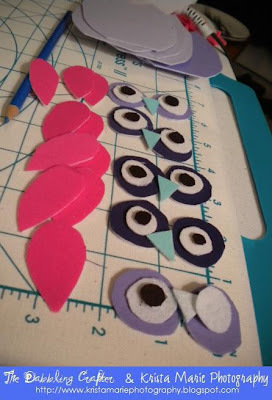 So in all that meant I had to cut out: 6 medium purple owl bodies, 6 light purple owl bodies, 6 sets of pink owl wings, 3 sets of dark purple outside eyes, 3 sets of medium purple outside eyes, 6 sets of white middle eyes, 6 sets of brown inside eyes, 6 aqua noses and 2 pink hearts. Using those pattern pieces you created earlier, you’ll need to cut out your fabric bits. Place pattern on fabric fused with interfacing, and trace with a fabric marker or chalk. I use a blue fabric pencil that disappears with contact with water. Once you have traced all your different pieces, you will need to cut out the pieces. Pair bodies together after cutting out to make sure they are trimmed and are flush with one another. Start pre-warming that trusty hot glue gun. I used the glue gun to get everything stuck together and then used my sewing machine to make sure that it’s not going anywhere. I think the glue gun itself would be enough, but I thought I would be extra careful. The first thing you want to do is add a loop to allow you to attach each owl to the mobile. Eye ball how much loop you want and cut your ribbon accordingly. I attached the ribbon with…you guessed it, hot glue! After attaching the ribbon loop, I then attached the two body pieces together with hot glue. After that I slowly made my way from bottom to top, giving each “layer” a chance to dry before moving on to the next one. So that means the order of gluing is: ribbon loop to body, body to body, nose to body, outside eyes to body & partially to nose, middle eyes to outside eyes, inside eyes to middle eyes, and last but not least wings to body. Continue this step until all pieces are assembled for each of your owls. Remember that if you intend on having a hanging middle section on your mobile, you’ll need loops at the top and bottom of those bodies. So, my middle owl and heart needed an extra loop on the bottom of their bodies in order to attach them to one another. (See next picture to get an idea of what I mean by this) You could even hook the loops together during this stage. I just used more ribbon to connect loops, but it would have been more polished to connect loops together during the gluing stage. Now you’ll have all your owls looking much like this. They have their brown loops ready for attachment on to the mobile and your middle hangers have an extra loop at the bottom of their bodies to allow them to be connected by more ribbon or you have already connected the middle pieces. You could be done at this point. They are looking pretty snazzy. Or you could try some finishing techniques. I jazzed up my owls by doing a stitch around the outside of the owl bodies. I’m not going to lie. With the hot glue in the middle making the owls extra thick, this stage wasn’t easy. The needle hated me and often got stuck in the glue. I kept an alcohol wipe handy to clean up the needle as I was going since it was getting uber gunky with glue. In addition to the glue issues, keeping a neat straight stitch was hard. I’m not much of an experienced seamstress so I had to go extra slow to make sure that the stitch remained neat. I had to be prepared with a stitch ripper to pull out anything that started to get messy. I also did a quick stitch in the middle of the eyes to make sure they stayed on. 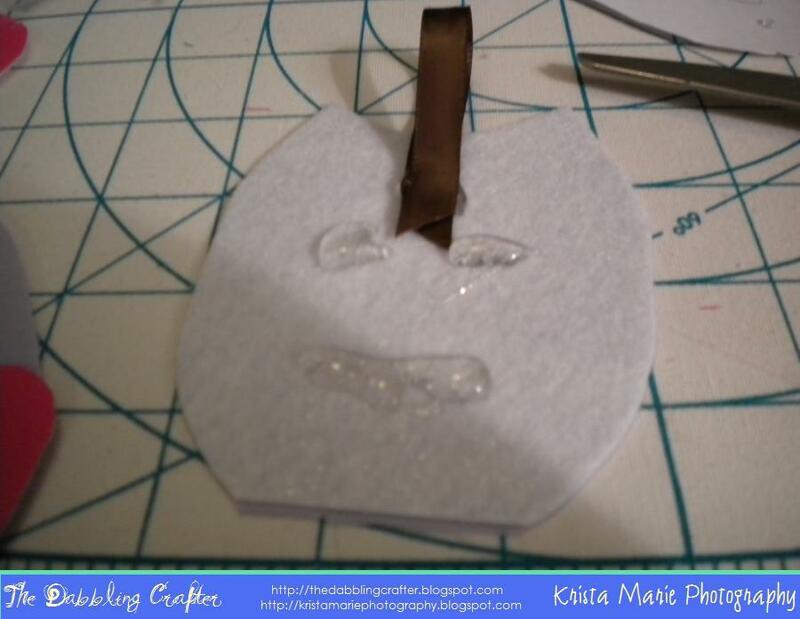 The second option for finishing the owls is to go around the sides of the owl with hot glue. This makes the ends look finished and prevents fringe; however, it doesn’t look as neat as the sewing method of finishing. The final step is to put everything together. I personally used a clearance mobile I found. I first cut off the stuffed mobile pieces they had. Then I removed the sticker they had on the music box. I used my handy dandy Goo Gone for this task. Another optional finishing is to replace the cloth covers that come with the mobile (mine came with these checkered brown covers). I chose to keep my mobile white for the time being, but I might replace these with plain brown or purple fabric in the future. However, for the time being I just stored these cloth covers away to use as a pattern if I decide to go down that road in the future. After removing the sticker and putting the mobile together (following the directions included in the mobile package), I attached the owls with brown ribbon. 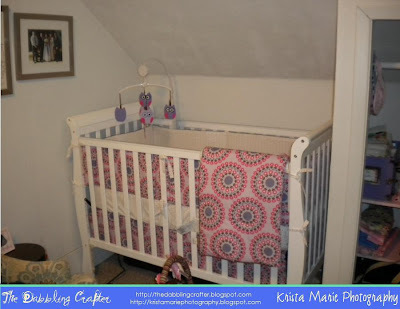 Step Seven: Finished Unique Crib Mobile! 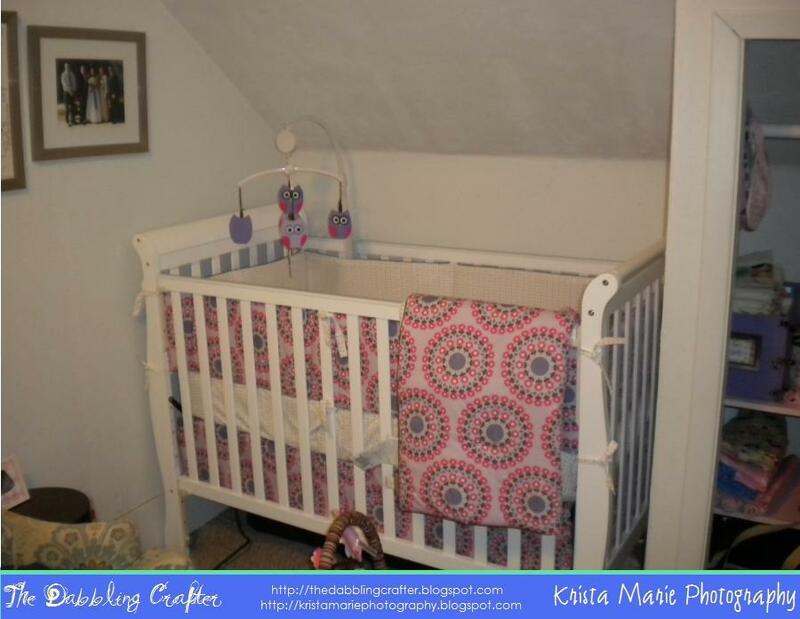 You are finished with your unique crib mobile. Attach it to your crib and sit back and admire your craftiness! could felt be used instead of fabric for this?